The Analytical Interview System™ was designed to provide the requisite skills to systematically apply proven and effective kinesics/behavioral and other interview/interrogation techniques in a logical manner, thereby resulting in the acquisition of verifiable and actionable information. AIS™ is a multi-phase interview and analytical system used to improve the communication process, and provides the skills required to conduct more efficient and effective interviews, interrogations and debriefings. The AIS Course is also GSA-approved and listed in the GSA schedule (GSA schedule pricing is based upon CONUS-based 3 and 5 day training courses). The foundation of the AIS process rests upon basic behaviors of human beings and their diverse communication styles, which are often overlooked during interviews/interrogations. During the AIS™ training course students are exposed to common human communication characteristics, as well as other unique behaviors used by non-specific subsets of the overall population. The identification and study of foundational human behaviors is used as a basis for determining whether an individual is being truthful, deceptive or simply evasive. Diagnostic interview techniques including vocal behaviors, written statement content and body language are provided during the course. The course also includes instruction regarding the distinction between an Interview/Interrogation, when each is appropriate, different techniques applied to each situation, proper room environment, evaluating attitudes and behavior, techniques to engage and retain attention, factors affecting behavior, paralinguistic behavior, basic questioning techniques – including how to ask behavior provoking questions and presenting alternative questions. Additionally, the topics of positive confrontation, handling denials and overcoming objections are addressed. Through the use of the AIS™ process the interviewer will be able to determine: the identification of an individual’s personality and rule system; analyze and manage an individual’s five basic responses to stress; identify truthful and deceptive behaviors; and utilize a deceptive individual’s emotional and cognitive denial efforts to obtain valid and actionable information. 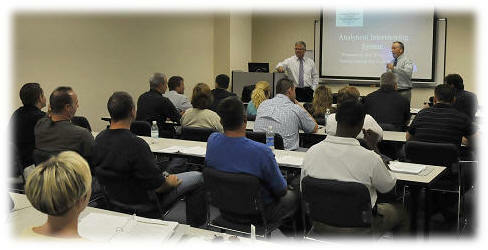 To register for an upcoming AIS class please go to AIS Schedule page. Don Wiebe is considered a leading interview and interrogation expert in the areas of verbal cue assessment, body language assessment, emotional leakage assessment, and micro expression assessment. Don is one of a small number of Canadians who have been government and court certified as Experts in the area of Determining Deception. As such Don provides opinions on the credibility of witnesses based on their verbal responses, body language, emotional leakage, and facial expressions. Don has over 30 years of police investigative experience, including assignments to the National Criminal Intelligence Section, Major Crime Section and Drug Squad member. Don has conducted thousands of interviews and interrogations and has a confession rate exceeding 95%. As a member of the Major Crime Section for over 12 years, Don specialized in complex homicide investigations and his case resolution rate was close to 100%. Based on his expertise Don was certified as an Interview/Interrogation Team Commander which enabled him to legally assume responsibility for and lead any Major Investigation in the Province of British Columbia. This designation is extremely difficult to obtain and requires certification by the Royal Canadian Mounted Police (RCMP) and other high-ranking police officials. In addition to the above, Don has been an interview and interrogation instructor for over 10 year, and has received praise in both the US and Canada for his dynamic and highly effective teaching style. He is often called upon by the media and television to serve as an expert analyst in assessing the veracity of statements made by individuals involved in high-profile crimes and other matters of interest. Don has provided training to US Federal and State Law Enforcement officers, RCMP members, US Military Intelligence, US Military Special Forces, US Secret Service, US and Canadian Military Police, various Sheriff’s Departments, County Police throughout the US, Assistant District Attorneys, Canadian Border Services, Canadian Police, Fire Investigators, Private Insurance Investigators, Private Bank Investigators, University Police, Hospital Security, and Provincial Management Agencies. Bob Wall has over 30 years of police interview and interrogation experience, which he honed while serving in numerous sensitive investigative assignments to include the Joint Integrated Street Crime Task Force, the National Criminal Intelligence Unit (Organized Crime Unit), and the Coordinated Law Enforcement Unit (a Joint Task Force focused on Major Crimes). While fulfilling his duties as a detective Bob also received The Lieutenant Governors Award for Bravery in the Line of Duty. During his tenure with the National Criminal Intelligence Section and the Coordinated Law Enforcement Unit, Bob directly participated in numerous high level city, provincial , federal, and international investigations. Due to his abilities as an expert interviewer, Bob conducted intelligence gathering interviews as well as debriefings of numerous high-level informants which led to the successful conclusion of a number of high-profile Federal and International cases. Bob is also a qualified Interview/Interrogation Team Leader and Primary Interviewer. As a pioneer in the Team Interview Concept, Bob became an expert in the field of Interview Planning and because of his unique qualifications he is regularly called upon to assist US and Canadian agencies in their efforts to produce successful interview plans. Bob is one of a small number of Canadians who have been government and court certified as an Expert in the area of Determining Deception. As such Bob provides opinions on the credibility of witnesses for legal and court proceedings. Bob is also a recognized expert in cellular telephone investigations. Bob has been an interview and interrogation instructor over the past decade and to date has trained US Federal and State Law Enforcement officers, RCMP members, US Military Intelligence, US Military Special Forces, US Secret Service, US and Canadian Military Police, various Sheriff’s Departments, County Police throughout the US, Assistant District Attorneys, Canadian Border Services, Canadian Police, Fire Investigators, Private Insurance Investigators, Private Bank Investigators, University Police, Hospital Security, and Provincial Management Agencies.